On October 2, 1950, cartoonist Charles M. Schulz’s daily newspaper strip Peanuts debuted with two kids sitting on a curb and remarking, “Here comes ol’ Charlie Brown! Good ol’ Charlie Brown… How I hate him!” Right there, on day one, Schulz established what kind of strip Peanuts was going to be: wry, bittersweet, and oh so quotable. For the next 50 years—until his retirement, which was soon followed by his death—Schulz spun jokes and stories out of big dreams, dashed hopes, and the complex interrelationships of a group of uncommonly mature, well-spoken children. In May 2004, the publisher Fantagraphics gave Schulz’s achievement its proper due, launching a project to assemble every Peanuts strip, in chronological order, across 25 handsome hardcover volumes, complete with introductions and indexes. A 26th volume of Schulz ephemera remains to be published in The Complete Peanuts series, but the last book of the original strips—with an intro by President Barack Obama and an appendix containing the complete run of the pre-Peanuts Schulz feature Li’l Folks—is due out on May 10. To honor Fantagraphics’ much-appreciated feat of cultural preservation, and to celebrate the 10th anniversary of the popular A.V. Club Inventory “Simpsons Quotes For Everyday Use,” here’s a handy list of Peanuts punchlines and observations that encapsulate both Schulz’s wit and keen understanding of how the world works. Schulz’s characters were so well defined that longtime readers could easily guess how each would react in any given situation. Here, the eternal fussbudget Lucy Van Pelt yells into the inky night as an indirect reply to her pious brother Linus, who’s illustrating an old Christian proverb about it being better to light a candle than to curse the darkness. Cue Lucy, cursing. Her angry exclamation could work for any of us as a way to overreact to a problem that’s frustrating but manageable. Countless essays have been written about the deep sadness and loneliness at the heart of Peanuts, which persisted even as the characters were being used as spokes-toons for feel-good products like candy bars and life insurance. No experience of childhood was more poignantly explored by Schulz during the strip’s golden age than having other kids laugh at you. Just the thought of it is enough to make a person’s face burn, decades later. It’s never not brutal, and you never get over it. But maybe one artist recognizing this feeling and turning it into a perfect aphorism can make the wounds heal a smidge. Schulz got a lot of comic mileage out of the juxtaposition between high dudgeon and common language. Here, the phrase of the day is “mushed up,” which is a casual way to describe what Lucy did with Linus’s drawings. In Linus’ mouth, a made-up term becomes a sputtering indictment of Lucy’s pedestrian tastes. We readers know that life is pretty much an endless succession of things that are too important to be mushed up: resumes, submissions to publishers, the hearts we wear on our sleeves, etc. Linus’ principled declaration might be futile, but thank goodness somebody still has enough pride to make it. Here’s another example of Schulz getting a laugh from something that’s not really a joke so much as an amusingly stilted turn of phrase. Still, Linus saying it to Lucy in response to her typically cranky complaint that “the whole solar system needs readjusting” is appropriate. In fact, it’s a good line to throw at anyone with a ridiculous, unsatisfiable complaint about the way the universe works. Schulz didn’t always put the funniest line in the last panel, but he did typically end with a single punchline. This strip is an exception, as Charlie Brown’s long reverie about going horseback riding with his beloved “little red-haired girl” ends with him getting unfairly peeved at Snoopy—who then tags on another punchline, sighing, “I know we’d get around to that!” That’s a well-timed topper, made all the funnier by the relatable frustration in the preceding line, “Why aren’t you two ponies?” Wouldn’t all our lives be vastly improved if we had easy access to two ponies? Charles Schulz’s fondness for the Bible has been well documented, and he frequently distributed the language of the King James version into Linus’ speech bubbles. Sometimes the gravity of our existential moments demands the diction of David in the Psalms, beset by enemies and crying out to the Lord in anguish. With perfect understatement, these strips allow Linus to express his despair with the mundane trappings of our less epic civilization: cornflakes and crew-neck T’s. The soul of Peanuts is in the ’60s strips, where Schulz started indulging in more whimsy while deepening his downbeat philosophizing. In the ’70s, the comic started getting a lot weirder as Schulz spent weeks sending his characters on absurd adventures that sometimes seemed to make sense only to their creator. In one of the funniest of these, Snoopy gets a coded message from The Head Beagle reading only “Thompson is in trouble!,” which sends Charlie Brown’s dog running off on a secret mission, wearing a fake mustache. For several days’ worth of strips, Snoopy skulks around, all the while grumbling about “that stupid Thompson” and all his past mistakes. (“The last time this happened, he almost got us all killed!”) This storyline was Schulz making fun of the conventions of spy novels, but “Thompson is in trouble!” is also a gripe that can be leveled at a dopey co-worker or an otherwise impossible-to-explain annoyance. Here’s what is, hands down, the most useful quote on this list. It works in any era. Companies love attaching current technological buzzwords to their products. Turbo, cyber, probiotic, 4G, smart, HD, crowdfunded… The list goes on and on. And the very best thing about this strip, at this moment, is all the current car commercials touting onboard wi-fi—a word deliberately coined to evoke the retro-futurism of hi-fi. How can a Chevy Tahoe be wi-fi? This line has been embraced by athletes and sportswriters, whether they’re in favor of the recent revolution in number crunching or they think advanced metrics are ruining the games they love. 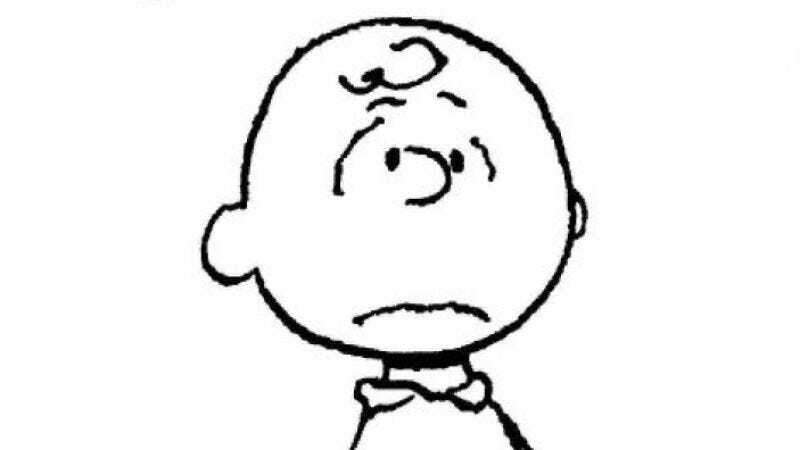 When Charlie Brown says it to Schroeder—to silence the latter’s litany of Chuck’s woeful baseball stats—it expresses a deeper understanding of awfulness that even an anti-science zealot can’t deny. Hate data all you want, but in learned hands, spreadsheets usually end up telling the uncomfortable truth. Here Charlie Brown is forced to admit that there’s an upside to the girls on his team forbidding him to mow the pitcher’s mound. How many quarterbacks lying on their backs after a vicious hit, listening to the crowd roar as an interception is returned for a touchdown, have stared up at the sky and enjoyed, however briefly, the smell of freshly cut Bermuda grass? It’s peaceful when you’ve already made your mistake and the world is playing out the consequences, without any further input needed from you. Schulz returned to this line a couple of times over the years, including in a strip where Charlie Brown tries to make the case for his favorite baseball player, Joe Shlabotnik. The first time Charlie Brown refers to “a spectacular catch of a routine fly ball,” though, he’s using it sarcastically toward his own outfielder, Lucy. Even beyond sports, this is a fine way to describe someone who accomplishes a relatively simple task only after expending a ridiculous amount of effort. This is one of those strips that’s most useful in the opposite situation than the one it depicts. Once it enters your consciousness, you will never be able to have a hot dog at a ball game without thinking about it. Which is a good thing, because hot dogs do taste better at ball games, and we should not be in such haste to absorb their all-American calories that we fail to enjoy this phenomenon. Although most Peanuts strips are pretty timeless, Schulz sometimes commented on his times in ways that sends today’s readers scrambling to Wikipedia. Even non-historians can dig around enough to figure out that the 1962 World Series ended on a scorching Willie McCovey line-drive out—stranding Willie Mays on second and Matty Alou on third—in a game in which San Francisco trailed by one run. Lifelong Giants fan Schulz was still stewing over the loss about two months later. A month after that, in early 1963, Peanuts repeated the gag, only this time Charlie Brown yelled, “Or why couldn’t McCovey have hit the ball even two feet higher?” It’s funny how hard it is sometimes to let misfortunes go, especially when they break against us by inches. Sports fans frequently experience the roller-coaster plunge from the heights of hope to utter despair. The hanging curve ball, the futile Hail Mary, the empty-net goal—all ignominious ends to what started with such promise. At times like these, there’s nothing to do but mark the death of all hope with stoic resignation. Aye. Thus endeth the ball game. Schulz generated a lot of material from Christmastime, which provided a perfect backdrop for so much of what Peanuts was about: spiritual yearning, cultural pressure, and deep, deep disappointment. You could mark the sharpening of the comics’ message in two holiday strips with Linus. In the first, the boy’s wide-eyed with excitement over the news that Santa’s on his way, and in Schulz’s amusingly elevated language, he wishes to “fervently wish him safe journey.” In the second, drawn about a decade later, Linus is so impatient that when he writes a letter to see how Santa’s doing, he ends up demanding that the old man stop dithering and just go already. Either phrase will work when anxious for something to happen. The choice of which one depends on how polite you’re feeling that day. The genius of the decision to leave adults out of the Peanuts frame is that we both identify with the perspective of the kids and recognize ourselves in their view of the older generation. Most of us tried something like Linus’ appeal to the diversity of creation to blunt criticism from our parents. Did it ever work? No. Were those theological arguments preferable to the trouble we were trying to get out of? As we can see from Linus’ expression in the last frame, no, they were not. Over time, Schulz built up an enormous store of concepts and characters that he could trot out for a quick joke or whole storyline. Just as Charlie Brown idolized hapless ballplayer Joe Shlabotnik, Snoopy had a crush on children’s author Helen Sweetstory, serving as her fan, secret admirer, volunteer biographer, and even attorney when her controversial book The Six Bunny-Wunnies Freak Out was banned from the school library. It’s hard to pinpoint exactly what Schulz was satirizing with this plot. Parental hysteria? Awkward attempts by kiddie entertainers to be hip and relevant? But it’s also hard to deny the wonderfully unselfconscious kookiness of the above line, spoken by Linus. Schulz probably chuckled to himself for days after he wrote it. Peanuts merchandising almost always flattened the ironies of the strip’s characters, reducing them to feel-good platitudes. There’s no better example than Joe Cool, Snoopy’s collegiate hipster from the ’70s who believes that wearing sunglasses and slinging slang renders him invulnerable. Anytime someone is substituting a cool pose for actual cool, take ’em down a peg with Joe’s shameless answer to Linus’ perfectly delivered straight-man line. Schulz had a way of recognizing both the pleasant and unpleasant thoughts and emotions that all of us have at some point or another, even if our experiences aren’t exactly like those of the Peanuts gang. There’s no better example of this than when Linus suddenly becomes paralyzed with self-consciousness thinking about the unwieldy lump of muscle taking up space in his mouth. So many of our basic human functions are meant to run on autopilot: breathing, swallowing, and not feeling like your own stupid body is against you. But Schulz knew exactly what it was like when something as natural as a tongue starts to feel like an alien presence. Just look at the expression on Linus’s face as he endures the horror of his failure at the true-false test. This is the end of a series of strips in which Linus goes into this test with no knowledge but utter confidence, reasoning that the true-false test is easy to game just by divining the right pattern of trues and falses. Here he has come face to face with the emptiness of his bluster. He’s fallen off the tightrope; the fireworks intended to dazzle the teacher have blown up in his face. The last line is the con man inside of Linus giving up the ghost. Linus was always supposed to be the smart and sensitive one in the Peanuts gang, but like a lot of bright kids, he had a streak of laziness that made him an underachiever at school, and like a lot of kindly souls, he had a secret streak of shameless materialism. This strip best expresses Linus’ contradictions—and, perhaps, Schulz’s. In interviews, the Peanuts creator sometimes talked about feeling underappreciated by the cultural tastemakers but sometimes said that critics made too big a deal of his silly little cartoon. He could be a lot like Linus, who here tells Charlie Brown that he wants to live a simple life of service while also being filthy rich and universally admired. Schulz periodically introduced younger siblings into his ensemble, but his first effort—Lucy’s little brother Linus—was so successful that it broke the mold. Because Linus is both naive and philosophical, he approaches every new experience with a charmingly transparent sort of fatalism. When you think about it, winter’s pretty apocalyptic. It’s understandable that Linus would think that when it’s over, it’s all over. Snoopy delivers this line after shutting up Lucy with a loud “BLEAH!” in response to her insisting that everything wrong with him is a divine punishment for his shortcomings. And Snoopy’s right to bleah. Maybe there should be more bleahing in the world. Internet trolls, bigots, busybodies… some people deserve to be bleahed. A few years back, a blogger suggested that if Peanuts fans cut off the last panel of every strip, then the comic would read as bleak, not funny. But devoted Peanuts fans already knew that the strip was melancholy, even when read all the way to the end. Just look at all the times Schulz would have Charlie Brown sit alone on a bench at lunchtime, beating himself up because he couldn’t bring himself to talk to the “little red-haired girl.” Those strips frequently end with our boy shuffling off with a sigh or muttering, “My stomach hurts.” The mouthful of a quote above is actually in the second panel of the strip in question, after which Charlie Brown tells Shermy, “If you have to ask, you’ll never understand.” No matter where that line is placed, though, it’s a prime example of Schulz trying to explain something ineffable—as a way of commiserating with everyone who’d get it.